You may read the title of this post and think I'm just another person who has dismissed the Occupy Movement, but that's not the case. Indeed, I've written several other posts about my first taste of the world of social protest, and I still maintain that the ethos behind the movement is a good one. Though I've long withdrawn from Exeter's branch of the movement, I find myself inspired to write on it yet again (in part due to the influence of Bruce Springsteen's latest album, Wrecking Ball), as I don't think I recounted the trigger event that caused me to really question how the movement in Exeter was being run. There are many who would describe the movement as being "all talk and no action", and the question of whether raising awareness counts as action is a complicated one, and perhaps better left for another day. 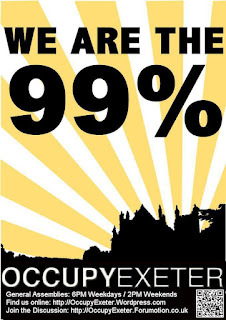 However, the uneasiness that I felt initially about being someone who has not really suffered as many others have suffered as a result of the cuts and economic downturn, was reinforced in a poignant incident at the only General Assembly I attended on Exeter's Cathedral Green. I forget what the issue that was being debated was now, though the camp had been established for a few days and had already attracted at least one homeless man. I thought this was a great thing. Here was someone who really was suffering (in a way none of the others could understand), and the camp was able to supply food and shelter for this individual, and even give him the chance to participate in decision making and talk about the issues affecting him. But, it seems the rest of the group did not necessarily see it that way. I should preface what I'm going to say by mentioning that while understanding the need for some rules during these open debates, I found the use of ridiculous hand gestures and actions extremely frustrating. Indeed, it seems there was a strange fixation on the rules of debate in Exeter, and when a friend of mine asked to address the group with a short speech he had prepared (about the abuse members of Occupy were suffering online), it was blocked by one of those present because people didn't usually make speeches! Never mind the fact that they asked to read the speech in advance (to censor it?). This obsession with rules was really brought home to me during the debate I attended, when the homeless man wanted to contribute to discussion and neglected to put his hand up to speak (travesty!). Just to make this perfectly clear, he was not shouting obscenities, or interrupting anyone. He was merely making a suggestion. However, he was cut off and told he must raise his hand if he wanted to speak. Again, I do understand that it is necessary to have some rules during debate to avoid utter chaos, though shouldn't it also be important to judge this on a case by case basis? On this occasion, would it not have been better to let the man speak? He is likely unaccustomed to middle class manners (through no fault of his own), and for that reason what he has to say should be listened to all the harder by the students, and other supporters of Occupy who are in stable employment, and don't actually understand the meaning of real poverty. 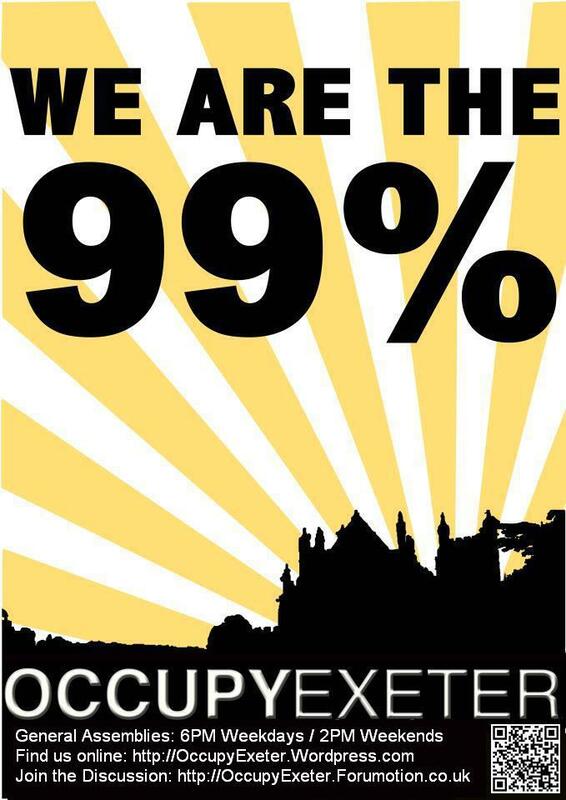 I'm not suggesting that all of Occupy Exeter are the same, but I found the general problem with my local branch was that people's desire to show people what they were doing was more important than what they were *actually* doing. Occupy Exeter were fortunate enough to receive a number of donations, in order to provide basic food for everyone in the camp. I think, if they were able to provide food and shelter for the homeless, while spreading their message of discontent, all the better, but even this was a subject of debate: should they provide for the poor? Yes. Or they are hypocrites. This is also why I have no patience with anti-occupiers who would dismiss the group as 'Anarchists'... If anything, a bit more anarchy would have served them well.